Wheel Thrown with Pulled Handles made from Riverside Grit, Cone 6 Stoneware. 1 Red Spoon Dimensions 9.25" X 3.5" X 1.75"
3 Buff Spoon Dimensions 8.5" X 2.5" X 1.25"
Dimensions for "This is not a Spoon" 1 are 9.25" X 3.5" X 1.75"
Dimensions for "This is not a Spoon" 3 are 8.5" X 2.5" X 1.25"
Dimensions for "This is not a Spoon" 4 are 11.75" X 3.25" X 1.5"
Dimensions for "This is not a Spoon" 5 are 11.25" X 3.75" X 2"
Dimensions for "This is not a Spoon" 6 are 7" X 2" X 2.25"
Dimensions for "This is not a Spoon" 7 are 4.75" X 1" X 1.5"
Sometimes the simplest ideas are a challenge to understand. A spoon is such a common tool for humans. 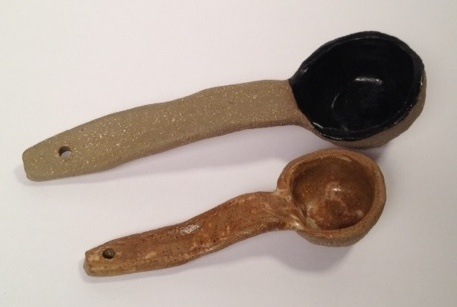 Perhaps it is easy to take the production and development of spoons for granted. I have been using this tool all my life, although I have never really considered the way it is held and designed, nor had I considered the multitude of ways humans use it. NOTES: Pulled handles with a slight curve feel the most natural. When using the spoon for scooping, then a deep bowl/scoop with a handle that angles forward is best. 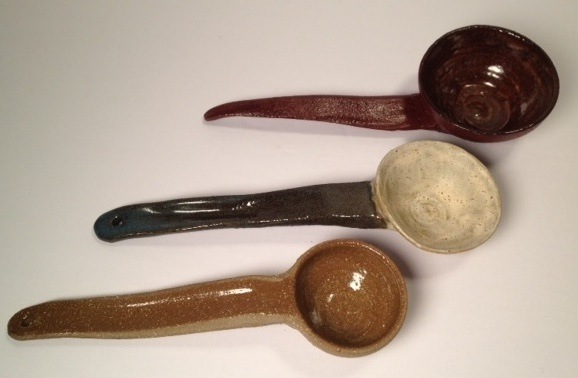 These spoons were made with Riverside Grit Stoneware clay and glazed at Cone 6 in an electric kiln.